The simplest way to view reef manta rays is to visit the Sheraton Resort Kona in Kailua-Kona at night. 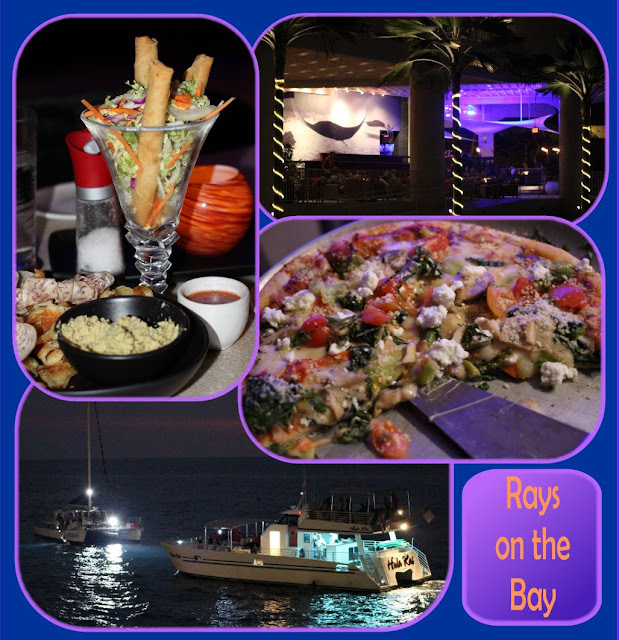 Off the back deck of the restaurant Rays on the Bay you will see the mantas glide through the waters right at the edge of the surf. It's not every night, but when they are there, it amazing to see the size of these animals. They skim the surface of the water feeding on the plankton attracted by the resort's bright lights. The area is where two ocean currents merge. It is common for a local volunteer to give a brief education on the life of the mantas. Although it is not required to eat at the restaurant, I recommend it. It makes a nice evening of good food and entertainment. Every time we've been there the food, service, and live music have been excellent. Pictured the guacamame, vegetable egg rolls, and Veggie and Goat Cheese Pizza. Rays' veggie pizza is my favorite on the island, and worth the trip. We also did the manta glass bottom boat and the manta ray night snorkel. I thought, “If one finds oneself on the Big Island during the Ironman World Championship, it would be silly not to experience a little of the excitement,” and I’m glad I did. is a line of volunteers and a line of swimmers. 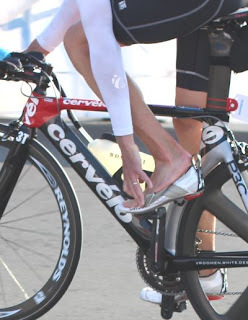 For those who don’t know exactly what Ironman entails, it is a one day 2.4 mile ocean swim, followed by a 112 mile bike ride, followed by a 26.2 mile run. Anyone would be proud to finish just one of these three events, but completing them all within the time limit in Kona makes one an Ironman (not gender specific). The morning of the race, while most people on the island were still sleeping, family, friends and fans of the athletes had lovingly written chalk encouragements on the street for their loved ones to read as they neared the finish line many hours later. How many hours that would be depended on the individual. The beginning and ending location of the swim portion. Spectators waiting for swimmers to come back to shore. Ironman 2012: Of the 1979 people who started the race, 95 percent finished it before the midnight time limit. The fastest time was Australia's Pete Jacobs 8 hours and 18 minutes and 37 seconds. While the last official finisher would come in more than 17 grueling hours after she began the race. She swam for 2 hours and 10 minutes, taking less than 10 minutes to transition from swimming to biking; she than biked for 7 hour and 37 minutes, taking 12 minutes to transition to running; and then ran for 6 hour and 49 minutes, crossing the finish line seconds before the midnight deadline. That person was Harriet Anderson who, although the last to finish within the time limit, won her age division (women 75-79). In fact everyone who started the race was already a winner. It was already triumph to be standing at the starting line. There was a palpable joy and exuberance associated with their having made it to the Ironman World Championship. The energy of nearly 2000 participants, being buoyed by thousands of the friends and families, commingled with the support of thousands of volunteers. The event has such a positive spirit and energy to it. The course is long, so there are plenty of places to get a good view. If you enjoy a good story, watching an Iron Man World Championship is a great place to be, as the people around you are happy to tell you the story of “their athlete” as they wait. have to stand on a roof to get a good view. The Official Results Guide forthe 2012 Kona Ironman World Championship makes some interesting reading. More interesting is reading some tiny tidbits of few of the awe inspiring stories and other places around the web, and on the official IRONMAN website. What to wear to watch the race: Most likely you won’t be standing in the shade. Wear a hat, sunscreen, and loose clothing. Most importantly wear shoes that are comfortable for walking and for standing on hot concrete. Yes, it is October, but I believe October is the hottest month for Kona. It was sunny and muggy. Dress for heat and walking and bring a camera.